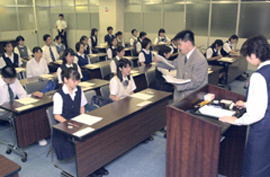 High school students take an employment exam in September 2002. Photo Courtesy of Kyodonews web CH-K.
About 17 percent of Japanese high school students go directly into the labor force. This proportion has steadily decreased over the past fifty years. Japanese companies hire new high school graduates for regular, permanent positions as blue-collar workers, and for clerical positions. It is common for employers to send a notice of job openings to high schools and to hire students who are recommended by the school. Many high schools have cultivated close relations with main employers in their area, and are assured of placing a certain number of students each year. The schools want to send their best candidates, in order to preserve this special hiring relationship, and the companies expect to receive employees who have been carefully selected. Since the school will recommend students based on performance and behavior, there is a strong incentive for students who are not going on to college to perform well in high school.This system also means new employees are likely to find other graduates from their school working at the same company, who will serve as their “sempai” or seniors, and help them out. In return, the new employees, as “kohai” or juniors may be asked to do special favors for their “sempai.” These relationships in the workplace are similar to the ones students experienced members of clubs and sports teams at school.